Thanks for stopping by! Please message me with any questions you may have! Mama Bear and her little cubs. Each bear has been hand sawed out with my jewelers saw. The Mama bear is stamped with Impress Art Bridgette and the tiny initials are stamped with Beadsmith Gothic. Choose 16", 18" or 24 " Necklace. Chain styles may vary. Metalwork is the art of making things out of metal. Each piece may not be perfect but this is what gives them character and makes them unique. All stamped, sawed and etched jewelry are made from scratch by me. Because of this there may be slight differences in each piece. Every letter is hand stamped individually, and may not be perfect. Each pierced and sawed piece is cut out by me and my trusty saw. The etching is first stamped or drawn on with ink to achieve the unique patterns. The metals I use are 20 gauge and 24 gauge jewelry grade Copper, Brass, Sterling Silver, Stainless Steel, Aluminium, Tin and Nickel. Most of these metals tarnish naturally. On some of my pieces I think this makes them more beautiful and rustic! I will be including a buffing cloth for polishing. It will ALWAYS go back to its original shine. The necklace came out so beautiful! It was exactly what I wanted. Very simple and sweet. I got it for my sister for Christmas and she absolutely adores it. It came to me in a timely manner and was exactly as Advertised. Sorry I'm so late on my review! I would highly recommend this to anyone! Quick delivery, exactly as expected. Looks great! 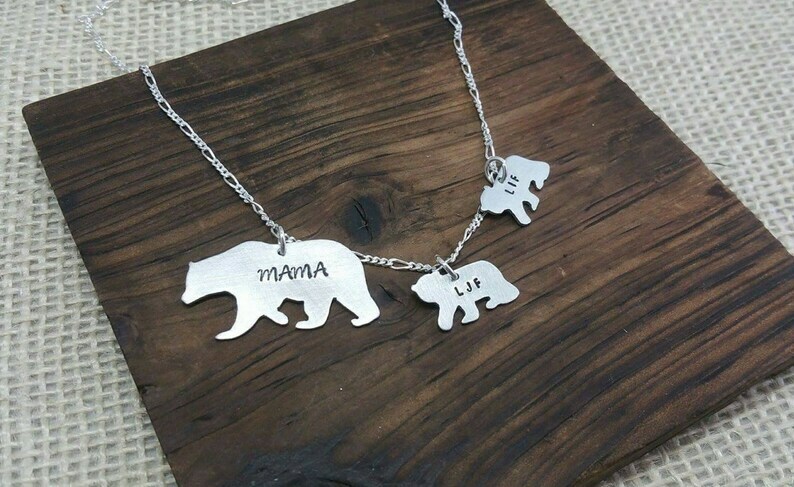 Couldn’t be happier with the custom necklace I requested for my mother with all of the grandchildren on it and part of her favorite phrase “I love you to the moon and back”. Good turnaround time, excellent communication with the shop owner, and lovely packaging. Highly recommend!!! If your jewelry from Lyons Metal ever needs to be repaired I can do so for the cost of shipping. $3.00 for First Class shipping to anywhere in the USA. Chain styles my vary on all orders. The metals I use are 20 gauge and 24 gauge jewelry grade Copper, Brass, Sterling Silver, Stainless Steel, Aluminium, Tin and Nickel. Most of these metals tarnish naturally. On some of my pieces I think this makes them more beautiful and rustic! I will be including a buffing pad for polishing. It will ALWAYS go back to its original shine.